Today is my birthday! I arrived at the cabin last night and was delighted by the brightly colored balloons tied to the mailbox and on the chair reserved for the ‘birthday girl.’ My niece bounced up and down and pointed at the happy birthday banner taped on the wall. “Auntie Beth, look,” she exclaimed. “Are the decorations for me?” I asked. Tonight I’m sure there will be a cake with candles, although I hope there aren’t fifty of them, and if there are, I hope the local fire department is on standby ‘just in case’ the house goes up in flames. Writing has become a very important part of my life, and it seems appropriate to share one of my earlier pieces as a way of expressing my happiness. The assignment was to blindly select an item out of the ‘junk’ drawer that resides in everyone’s house. Birthday candles, a symbol of happiness and dreams. They’ve been around since the ancient Greeks, who were said to place candles on the cake they offered to Artemis, the goddess of the moon. Some believe that the custom of lighting birthday candles was born from the belief that the gods lived in the skies and the tiny flames sent signals and prayers to the gods and therefore their prayers were more likely to be answered. Each birthday there is one more candle on the cake, one more flame flickering, teasing, reminding us that one more year has passed. No matter how old we get, and although it’s hard to admit, there’s something that makes you feel special when you see those candles burning. When I first picked up the box of birthday candles, I instantly thought of my kids. Memories of their cheeks puffed out as they desperately tried to blow all the candles out at once. There’s nothing quite as daunting as blowing all the candles out in front of your relatives, especially if those relatives have perfect pitch when they sing happy birthday. Seriously, who sings happy birthday well? My mind drifted from memory to memory. From chocolate cake on baby faces, to the grin of a teenager being served pancakes brightly lit with the ever familiar birthday candle. I recalled the obligatory pictures as they each grinned and held up their cake for the camera, snapshots of their childhood freezing time for just an instant. There’s nothing quite like a birthday wish, closing your eyes, taking a deep breath and in one mighty exhale, we hope that we’ve blown out all the candles. And if we have, our wish will come true. At the very least we won’t end up with any unwanted boyfriends or girlfriends. As a child, I remember spending weeks thinking about what would be the perfect birthday wish, something that was sure to come true. Hoping that my parents would read my mind and I would find that very special present waiting for me. Of course I didn’t dare reveal what I dreamt of. Everyone knows if you do it most certainly won’t come true. Do birthday wishes come true? I believe they do. As a child the wish is fulfilled by the room decorated just for them, the brightly wrapped packages arriving with their guests, and the warm glow of the candles on the cake. As we mature, we realize that on that special day, when we celebrate with family and friends, our wishes are fulfilled with love and laughter and the celebration of life. The box of candles that stays in the drawer until it’s someone’s special day. On that day, the yellow box filled with peppermint striped candles is pulled out of the back of the drawer. There may be balloons and banners, perhaps even confetti or streamers, but candles will always represent the birthday celebration best. Birthday candles, a symbol of memories and celebration. < If the Pizza Box Could Talk….. Thanks Lynn! Its been a fabulous week, I couldn’t have had a better brithday. Happy birthday! Your blog is so much the “chicken soup for the soul” inspired writing and the history of b-day candles t boot. An anthology with some type of creative hook to weave it together would get certainly get this published. I’m not a month late as I have been known to be. I kept putting your birthday in September, Why? I don/t know. I really enjoyed the piece you wrote about birthday candles, and most of all, that you had a GREAT Birthday with your family. Happy “50”, and I hope there will be many, many more. Happy B-day, Beth. Looking good, both you, and the writing. 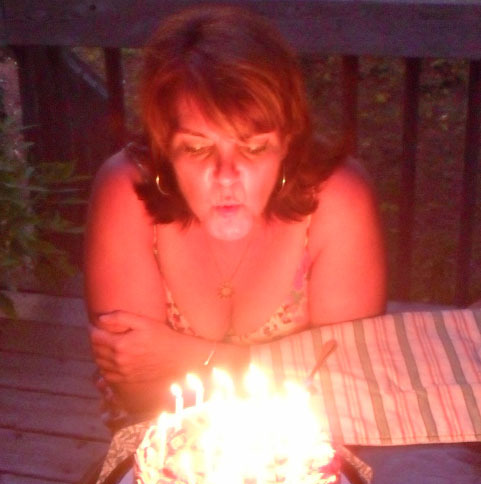 Love the birthday candle musings……..